Toruń Symphony Orchestra, which gives concerts in the Grand and Small Halls of the historic Arthus House has in its repertoire a few hunderets of pieces from Baroque to the present. It cooperates with Poland's best conductors, soloist-instrumentalists, vocalists and choirs. The Orchestra was founded as the Toruń Chamber Orchestra in the artistic season of 1978/79. Untill today the ensemble has become a fixed element of the city’s culture, organising concerts at home and making Toruń famous when touring Poland and abroad. The Toruń Symphony Orchestra, since its foundation, has given around two thousand concerts in all Polish cities, in many European countries (such as Belgium, Switzerland, Czech Republic, Slovakia, Germany, Denmark, United Kingdom, Italy, France, Belarus, Lithuania) and at prestigious festivals. Moreover, the Orchestra has recently toured China for a month. Another important aspect in the Orchestra’s activity since 1997 has been organising the yearly Europe-Toruń. Music and Architecture International Summer Festival. Within the Orchestra, three smaller ensembles are active: the Toruń String Quartet, the Toruń Brass Quartet and the String Quartet of the Toruń Symphony Orchestra. Made up of artists who are members of the Orchestra, the ensembles make the concert repertoire more attractive and improve the cultural life in Toruń and the whole Kuiavia-Pomerania region (Województwo Kujawsko-Pomorskie). Furthermore, the Toruń Symphony Orchestra provides musical education for children and youth in Toruń and the Region, which is very important. The Orchestra has cooperated for years with the Karol Szymanowski Complex of Music Schools in Toruń, making it possible for outstanding young artists to perform as soloists at special concerts with the Orchestra. The final attraction of the annual Days of Toruń City Festival are open-air opera presentations held in the picturesque area of the moat by the Teutonic castle ruins. 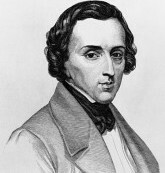 The greatest Polish composer and pianist, Frederic Chopin, was related with Toruń with family connections. His godfather was Frederic Skarbek - Toruń famous economist. Chopin stayed in Toruń in August 1825, and lived in the Fengers Palace. In Toruń, Chopin could admire the specific, highly diversified architecture, including the mediaeval burgher buildings, the granaries and also the gothic town hall. The first Toruń organ was constructed in 1343 in St James’s Church. It was, at the same time, the oldest instrument of its kind in the Teutonic State and the whole of Pomerania region. Apart from marking special occasions, music played an important role in everyday life of Toruń burghers in the 16th and 17th centuries, when the city was an autonomous 'burgher republic'. Music culture was shaped by several professional music circles, the most important of which undoubtedly involved those centered around churches, the Academic Gymnasium and the Jesuit College. These included precentors, organists and preceptors. Their activities aroused a strong interest among Toruń inhabitants attending not only public music performances, but also organizing concerts in their homes. Toruń Academic Gymnasium precentors included eminent musicians such as the Renaissance composer Paulus Bucenus (circ. 1570) or the Baroque composer Johann Celsher (1601-1604). Toruń printing house had a ready set of music notation symbol fonts in the 17th century, which was repeatedly used by precentors for printing their cantatas. Its printing services were also appreciated by priest Wojeciech Dembołęcki, a Franciscan, who issued his work on religious music entitled Beneditcio Mensae (1616) in Toruń. The role of music education was strongly fostered by the Academic Gymnasium. By the mid-17th century, music classes were mostly divided into two parts – music theory lectures and music practice including singing or playing instruments. From the second half of the 17th century until the 18th century, music education was linked mainly with the choir practice. It is worth mentioning that it focused not only on performing compositions dating back to the classical period or the medieval times, but also on modern music written largely by composers from Royal Prussia, including Toruń. The Mannerist organ of 1602-09 in St. Mary’s Church (>>) is an outstanding example of Toruń high-class sculpture. The organ pipe set is a high-level sculptural masterpiece abounding in ornaments and complex allegories. The organ is one of the oldest such instruments in Poland, characteristic of northern Europe. Another masterpiece of that kind is the Mannerist organ of 1611 in St. James's Church (>>). It is profusely adorned with carved acanthus leaves, grapevines, mascarons, lions' heads, puttos, fruit bunches, wrought-iron decoration and coats of arms of Toruń, Royal Prussia, the Republic of Poland-Lithuania and the New City of Toruń. Besides that of St. Mary's Church, the organ is among the oldest and most precious such instruments in Poland. 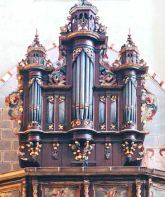 The Baroque organ in St. Johns' cathedral (>>) is smaller and more modest instrument than the two above. It's been built in 1688. It is the work of a Toruń workshop, which later built the instruments in villages of Topolno, Górsk near Toruń and in the town of Kowalewo Pomorskie. The instrument is similar to many such objects in Greater Poland (Wielkopolska) and Mazovia (Mazowsze) regions. The precious Rococo organ front in the Church of the Holy Spirit (>>) went down in flames in 1989 and has been under reconstruction since 2004. The organ, dating back to 1757, was an outstanding example of woodwork art and an illustrious musical and artistic masterpiece. In the year 1878 there were made a massive neo-Gothic organ prospect in the back of the main nave of St. Johns' cathedral. The organ have replaced smaller Baroque instrument. Republika (the Republic) - rock band formed in 1981. From the beginning associated with the Student's Culture Club "Od Nowa" where it used to perform and was taking the rehearsal. It moved its sound closer to New Wave. During the period 1982-1985 it was one of the best and most interesting groups on the Polish rock scene. As a result of misunderstanding the Republic fell to pieces in 1986 to return in 1990. In the 1990s the band run regular activities. In 2001, after the death of the leader and vocalist Grzegorz Ciechowski, the group ceased to exist. One of the greatest hits was "Nie pytaj o Polske" ("Don't ask about Poland"). See also: Grzegorz Ciechowski Artistic Awards here. Kobranocka - rock band formed in 1985. Originally called "Flying urinal". Has been playing music that refers to the punk rock with strong pacifist lyrics. A characteristic feature of Kobranocka texts (usually written by Andrzej Michorzewski - psychiatrist by profession) is the abstract metaphor. The biggest hit of Kobranocka is the song "Kocham cie jak Irlandie" ("I love you like Ireland"), which far from their style. Atrakcyjny Kazimierz (the Attractive Casimir) - band founded in 1992 in Toruń by well-known and associated with the band Kobranocka, Toruń musician Jacek Bryndal. Patronage on the project was taken by Małgorzata Potocka, who gave also the name of the group. The music for songs on the debut album "Prawdziwa Miłość" ("True Love") was written by Jacek Bryndal, texts by his brother Rafał Bryndal. Producer and author of the arrangements was Grzegorz Ciechowski from "Republika". The Atrakcyjny Kazimierz won the prize at the Polish National Song Festival Opole for the song "Otyłość" ("Stoutness"). The song "Jako mąż i nie mąż" ("As a husband and a not-husband") won honorable mention in the January edition of the Poland's Music Ones Contest in 1994. In 1994 they released the movie musical "The Wedding of Atrakcyjny Kazimierz" which was set of parts of the band's biggest hits. Nocna Zmiana Bluesa (the Blues Nightshift) - blues band from Toruń, founded in 1982 by Sławek Wierzcholski - a harmonica virtuoso, singer and songwriter. With the band he played hundreds of gigs in Poland and in several countries, such as Russia, France, Greece, the Nederlands, Sweden and even Zimbabwe. Sławek has recorded fifteen albums with this band and also under his own name. With the Nocna Zmiana Bluesa he opened for The Blues Brothers Band (Nuremberg 1989) and B.B.King (Warsaw 1996). Sławek's harmonica can be heard on some movies and TV series soundtracks. Sławek is the author of two harmonica instruction books, TV harmonica course and he teaches harmonica at the workshops in Poland and France. Sławek has been chosen No. 1 harmonica player in Poland by the "Blues Top 2002" voters. Also his band has been chosen No. 1 blues band in Poland. Manchester - the group was founded in 2006. A year after the formation Manchester took part in the most famous Polish rock festivals: in Węgorzewo and Jarocin. Culmination of the year 2007 was participation in the finals of 'MTV Rockuje' and a live concert on the occasion of the 50th anniversary of the birth of Grzegorz Ciechowski where the band made their own arrangements of works by the Republika. The year 2008 brought the victory in Top Trendy music festival. Music that Manchester plays is brit-pop with elements of punk-rock. Sofa - music band founded in 2003, playing hip-hop, soul, funk, jazz and R & B. The band is set up with six musicians including three vocalists. The group presented itself to wider audience to play concerts with world stars such as US3, Snoop Dogg, or Lauryn Hill. Wow you named a band after the coolest city in the Uk! You named it after my city ! Thanks Manchester is my heaven! Toruń Symphony Orchestra gives concerts in the Grand and Small Halls of the historic Arthus House and has a few hundred pieces in its repertoire ranging from Baroque to modern.